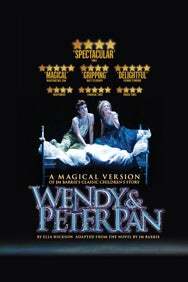 We do not curently have theatre tickets available for Wendy & Peter Pan. This could be because we have simply sold out or it could be that this show is no longer running. The information on this page remains purely for historical and informational purposes. Join us this Winter as we return to Neverland with Ella Hickson's acclaimed re-telling of JM Barrie's classic chidlren's story. Jonathan Munby's spectuclar sold out production wowed audiences when it opened in the Royal Shakespeare Theatre in 2013 and we are delighted to bring it back for 2015. Wendy, Peter, Tink, Captain Hook and the Lost Boys are wating to take you on an unforgettable journey.